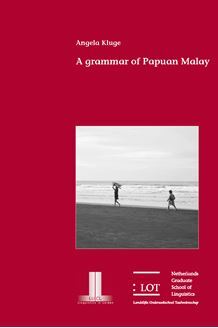 A grammar of Papuan Malay Back cover abstract Angela Kluge 3 April 2014 This book presents an in - depth linguistic description of one Papuan Malay variety , based on fifteen hours of recordings of spontaneous narratives and conversations between Papuan Malay speakers . â Papuan Malay â refers to the easternmost varieties of Malay ( Austronesian ) . They are spoken in the coastal areas of West Papua , the western part of the island of New Guinea . The variety described here is spoken along West Papuaâs northeast coast . Papuan Malay is the language of wider communication and the first or second language for an ever - increasing number of people of the area . While Papuan Malay is not officially recognized , and therefore not used in formal government or educational settings or for religious preaching , it is used in all other domains , including unofficial use in formal settings , and , to some extent , in the public media . After a general introduction to the language , its setting and its history , this grammar discusses the following topics , building up from smaller grammatical constituents to larger ones : phonology , word formation , noun and prepositional phrases , verbal and nonverbal clauses , non - declarative clauses , and conjunctions and constituent combining . Of special interest to linguists , typologists and Malay specialists are the following in - depth analyses and descriptions : affixation and its productivity across domains of language choice , reduplication and its gesamtbedeutung , personal pronouns and their adnominal uses , demonstratives and locatives and their extended uses , and adnominal possessive relations and their non - canonical uses . This study provides a point of comparison for further studies in other ( Papuan ) Malay varieties and a starting point for Papuan Malay language development efforts .